I’m so excited that my hat is finished! So I asked my DH to snap this picture. Cool, huh? And the Bowler Becomes a Fedora! I re-felted the hat some yesterday, and it is clearly has decided to shape itself in a different direction. It maybe wasn’t what I intedend at first, but hey, it’s cute, don’tcha think? It’s still damp, but I hope to wear it on Friday. Well, here’s the hat after felting! It’s not quite what I wanted it to be but I haven’t given up hope yet! First of all, there was a rather large hole near the center of the crown at the top… I must have droped one of my K2tog’s when decreasing or something. I tried felting another piece of fabric to it but it would not stick. So then Rhoda suggested that I darn the hole, and re-felt the hat in that area. It worked! The hole is gone! The hat overall was not felted enough at first, and I’m still not convinced that it’s small enough yet. The crown is nearly there but I don’t know what to do with the brim. It is just too floppy to hold a turned up shape like I like. I’m wondering if it will ever get firm enough, or if this is just one of the idiosyncracies of the AC-02 pattern as opposed to the AC-01. I definitely was after a chic, rolled brim, rather than a big floppy hat. Sigh… I hope I can get it to the way I want. Perhaps I should have opted for the narrow brim option, but it seemed so narrow that it practically covered the crown section in the example photo. And since I did a strioed band on the lower part of the crown, I wanted it to show! So, I’ll be messing with this for a while yet in hopes of getting the brim firm enough to actually do something with it. Wish me luck! I’ve been in my knitting comfort zone the last couple of weeks with this hat project. Except this time I’m using the Fiber Trends AC-02 pattern, which uses one strand of yarn instead of two. And I modified the brim just a little in terms of the number of rows for the wide brim style. So we’ll see how the shape looks when I’m done! I’m also using the Random Stripe Generator, except I modified the number of rows needed because I decided to make my stripe section a bit narrower than I first thought I would. Right now the color combos look, um, interesting… haha! 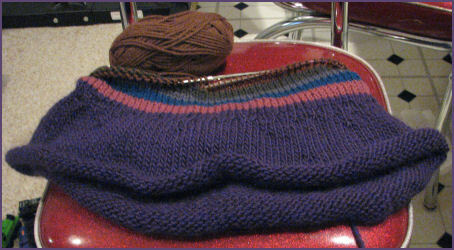 But I think when I get the top couple of layers of stripes on it will all come together nicely. 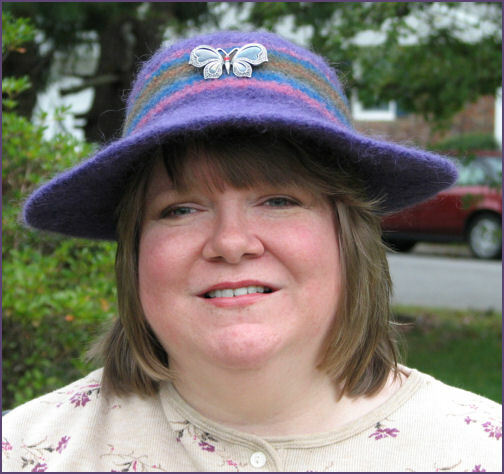 My summer knitting buddy Rhoda was here yesterday and we went through my collection of hat pins and I found a cute butterfly that has a subdued green color in its wings that will go nicely.